When you’re on your A game with the things in your life that fill you with energy and purpose, it can be an amazing feeling. But if you don’t take time to breathe once in awhile, what used to energize you can eventually take an ugly turn. In this episode, you’ll gain an essential toolkit to go from burned out to fired up. Listen now to transform your perspective and fall in love with your life again. 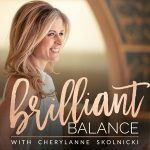 Brilliant Balance is a podcast for working women who are ready to shine. Each week we will discuss ideas, inspiration, and insight on balance, business, and getting it all done gracefully. Are you ready? Let’s be brilliant.